Transfers are made with comfortable 9-seater (8+1) grey metallic Minibus, new, with efficient air conditioning, Hi-Fi system, bike carrier, large trunk, standard child seat, ESP stabiliser for electronic stability control. Does the plane delay? No problem, the waiting time is free for the first hour. We can be reached H 24 by mobile phone for every need. 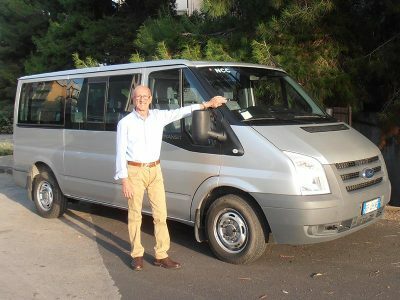 MEETING POINT: at Catania Airport (ARRIVES) or at any other agreed point, our driver will have a sign with your name and logo of our company.